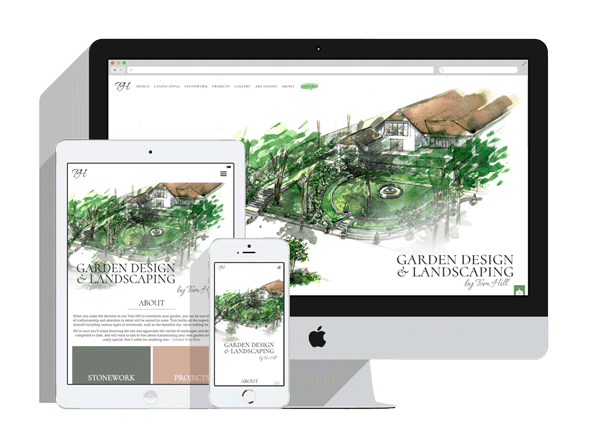 A case study detailing our recent work producing a new website and performing SEO for Tom Hill Garden Design. We have to start by admitting we were (and still are) quite excited by this project. Not all businesses are blessed with photogenic products and services but Tom Hill’s work is a huge exception. With a massive collection of amazing imagery, we knew that it was a great opportunity to create a site which really showed off his work. Looking at his site it was easy to see why it wasn’t ranking; almost all of the text was embedded in pictures, meaning that Google couldn’t read a word. With no easy way to fix the problems it was decided it was best to start afresh and create something new. Together we selected and bought a new domain name “tomhillgardendesign.co.uk” and got to work looking at all of the projects and images we had to choose from. Now I’m not going to lie, going through thousands of photos, including some holiday snaps (Hi Frankie) and touching them up ready for use was a huge part of this job. Eventually we got down to about 20 or so core projects, each with between 5-10 images for use. Tom meanwhile had been writing copy for each of the projects which we then subsequently edited and optimised for SEO. We had all the images and copy sorted so we set to work with the build. Being a self-taught watercolour artist and illustrator, Tom often produces artist’s impressions of the gardens he designs. Obviously, this is something pretty special and I would think there aren’t many garden designers who offer this let alone do the artwork themselves! We felt that his watercolour designs should have pride of place and decided to have a full screen example of a recent project on the homepage. It’s a stunning piece of art and we think it’s the perfect welcome to the site. Moving on, we looked at typography and a colour palette, discussing the former with Tom, and selecting the latter from the colours used on the homepage image to give continuity throughout the site. Using our dynamic CMS we created a couple of template pages and then loaded all of the pictures and copy into them. Each time we started loading a new project a new page would be automatically created, complete with all of the SEO Meta titles etc. that you need to rank well in Google. 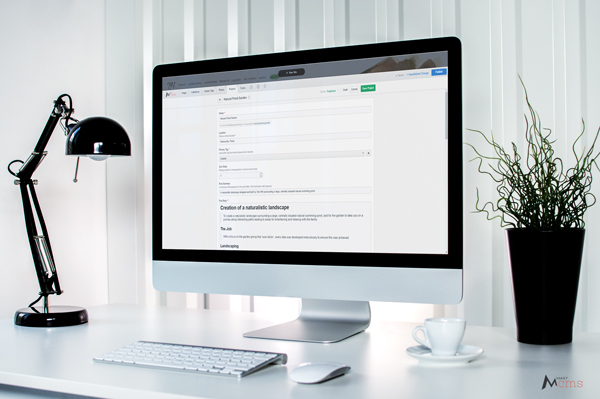 This saved us stacks of time and ensured all of the project pages have a consistent look and feel to them. What’s more it’s simple to use, and Tom can now login and upload new projects and edit existing ones himself if he chooses. 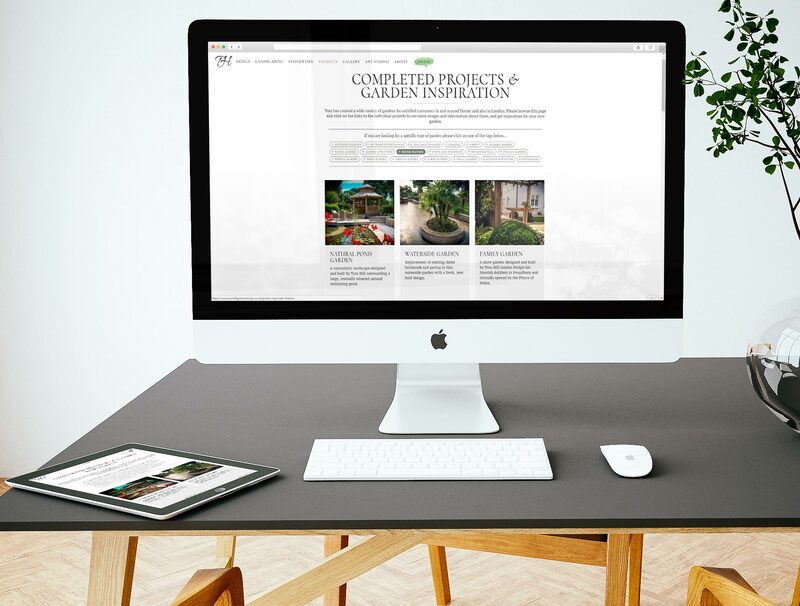 Tom has designed and landscaped a wide variety of gardens and there are about 20 to view on the new website. Each of these gardens features a number of key elements and of course each has its own style or theme. Initially we started with grouping the gardens together based on one primary feature, style or size, but we quickly realised we weren’t doing justice to Tom’s work and were limiting the results you would see. For instance, the first garden on the projects page “Natural Pond Garden” was categorised as a “Large Garden”, but aside from being large it’s got loads of other great qualities - a water feature, custom structures, a firepit, etc., and we wanted it to show up for all of those things, not just one. To overcome this issue, and to ensure that people can easily find gardens with the features they desire, we put in place keyword tags. Each garden has a number of tags associated with it, so for instance that could be “Custom Furniture” + “Italian Garden” + “Small Garden” + “Water Feature” etc. All of these show up on the garden itself but also in a few other places around the site. So simply put, visit the projects page, click a tag and we’ll put all of the gardens featuring that tag in front of you. We hope that you find visiting Tom’s new site as enjoyable as we did building it. We think you’ll agree that the sheer variety of high-end gardens featured is a testament to Tom’s professionalism and expertise. We've thoroughly optimised the new website so that it climbs the Google rankings for various terms. It’s early days and the new site has only been up and running for a couple of weeks, but in that time it’s already moving up Google and we expect it to be challenging for a range of keywords soon. 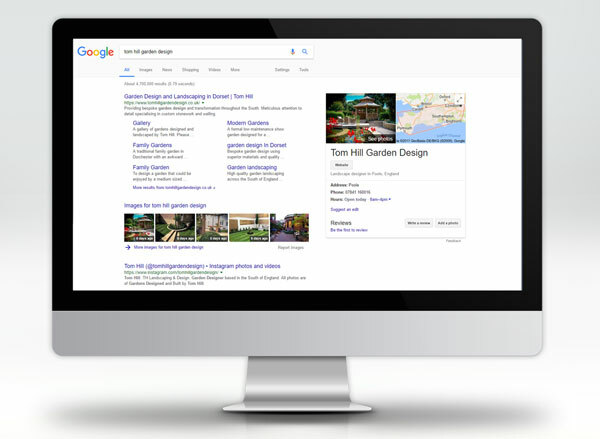 Tom can finally tell customers to simply Google “Tom Hill Garden Design” and he will show up in the number one spot! Website design and SEO aren’t one off jobs that you undertake every couple of years. To get to where you want to be and to see results, continued improvement and optimisation is needed. We’re looking forward to working with Tom in the coming months and years to build upon the platform we’ve created and ultimately help him generate more enquiries and business. "When I initially met with the guys from Digital Mast we discussed the problems I was having with my old website and I knew immediately that they were the right company to solve them. Chris and John were very enthusiastic about working with me and it was easy to see they were willing to put a lot in to produce something special. They are very passionate about what they do which shows in their high quality of work. Throughout the site build, Chris and John worked closely with me, talking through every step of the design process. They listened to my ideas and took them on board which sometimes isn’t the case when having something designed for you. They both have the drive to give you the best they possibly can and are willing to go that extra mile to give a great service. When Digital Mast revealed the finished design I was more than pleased, with it surpassing my expectations. They have created a stunning website with clean crisp visuals, it works beautifully and is easy to navigate through. They have already got it high up on google which I thought would take a much longer time. I would highly recommend Digital Mast if anyone in looking for a web design or SEO Agency in Bournemouth. Their attention to detail and design is second to none as is their work ethic and customer care." Visit the Tom Hill Garden Design site to see more of our design and of course his amazing work.